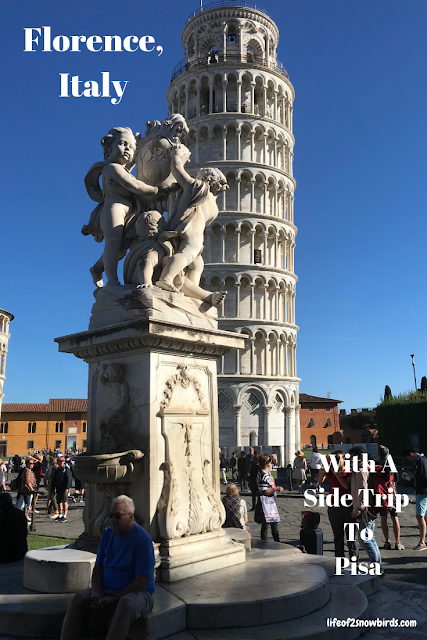 I'm not sure how long a Mediterranean cruise was on our bucket list. What I do know is that the reason we wanted to go on this cruise was because we wanted to see Rome more than anywhere else in the world. We dreamed about visiting the Vatican Museum to see the Sistine Chapel ceiling and St. Peter's Basilica to see the beautiful Pieta, another Michaelangelo masterpiece. So we found a 12 day cruise that included Rome and as a bonus, Venice which was also high on our bucket list. 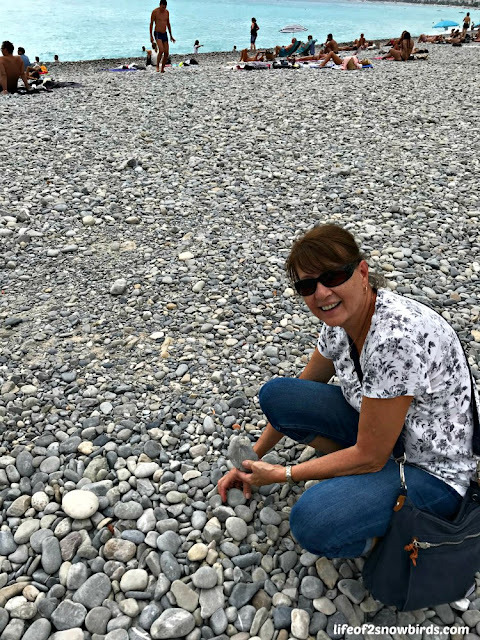 Seeing Europe on a cruise allowed us to visit many interesting places in one trip, but it didn't leave us much time to spend in each place. 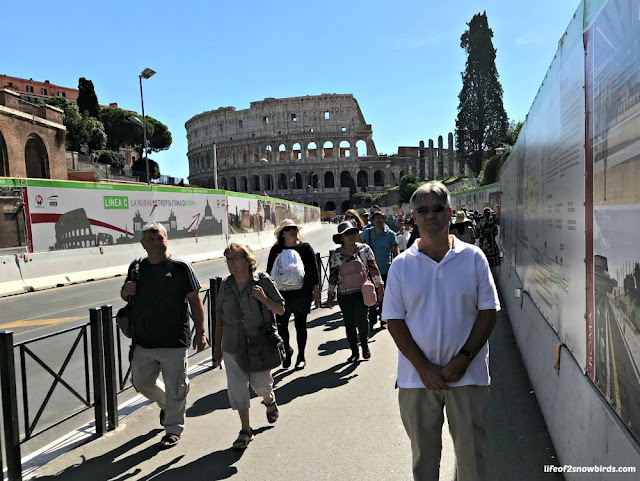 Besides for visiting Vatican City, we wanted to see the Trevi Fountain and other famous sights that are in Rome and we only had a few precious hours to fit it all in. Our cruise ship docked in Civitavecchia which was miles away from Rome. 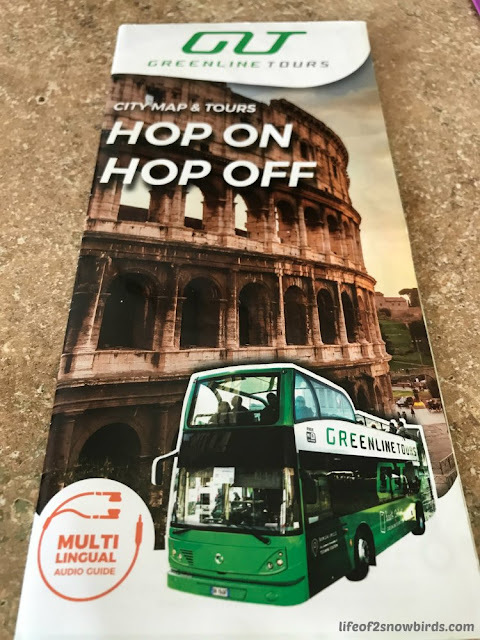 We needed to find the quickest way to get to Rome from there and decided that we would book the excursion, Train Transfer By Roma Express. 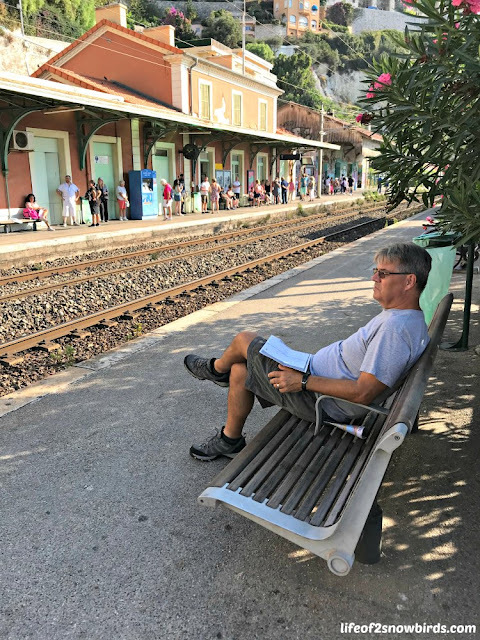 This express train would get us to Rome in 50 minutes and it would also include a shuttle ride to the train station which would save us from having to find the station ourselves. It would also include a guide who would give us tips and other information that would help us find our way around Rome. 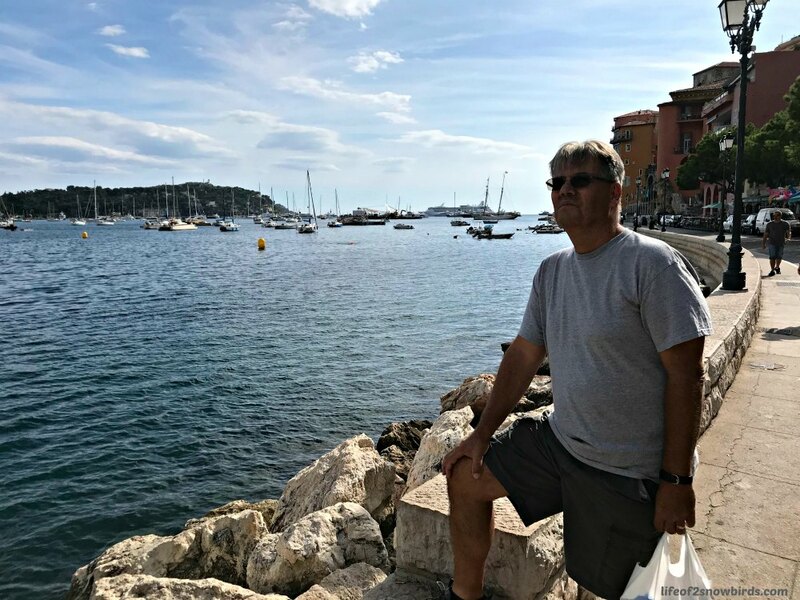 One of the things we like about cruising, besides for having a variety of excursions available that are easy to book, is that you have the chance of meeting new people that have very interesting stories to tell. On our 50 minute train ride to Rome we sat with a couple from St. Louis. They told us about how they lived in a total of seven states and were currently looking for a new state to live in. One state they wouldn't return to is California because of their experience of being at the San Francisco - Oakland World Series game during the terrible earthquake of '89. They do not want to relive the feeling of terror they felt as the stadium swayed back and forth. I didn't blame them for feeling a little nervous about living there again! Once we got to Vatican City, we took off to find the hop on, hop off bus that would bring us to four of the most famous sights of Rome. We thought that would be the easiest and fastest way to get to each sight. We needed to get back to the Vatican Museum by 1:00, which is the time we reserved in advance online, to enter. This meant we only had time to take a quick picture and get to the next sight as quick as we could. It turned out to be easier for us not to use the hop on, hop off bus and just use our legs, and GPS (that we finally figured out how to use) to get us to where we needed to go. Our advice is to just use the cheaper bus to get you to this area and back if you are pressed for time. 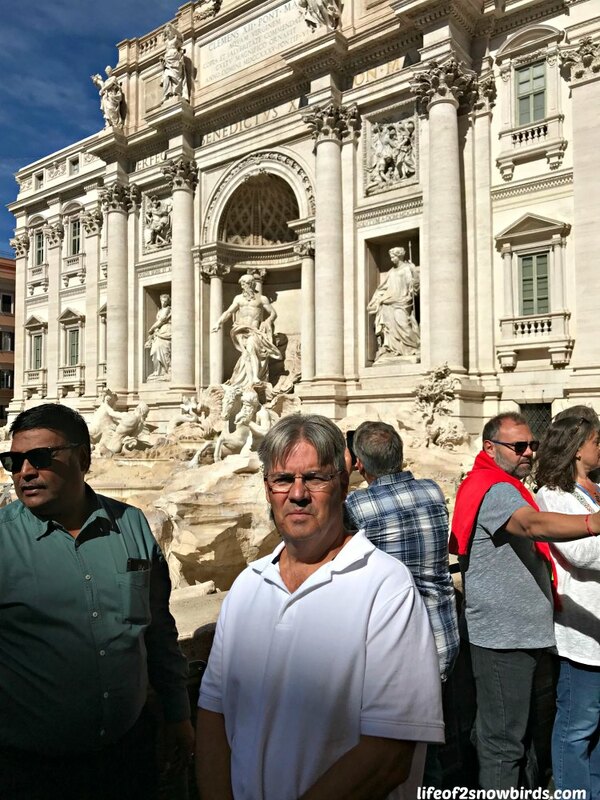 After being stuck in traffic for most of the bus ride, we hopped off when it neared Trevi Fountain and ran. 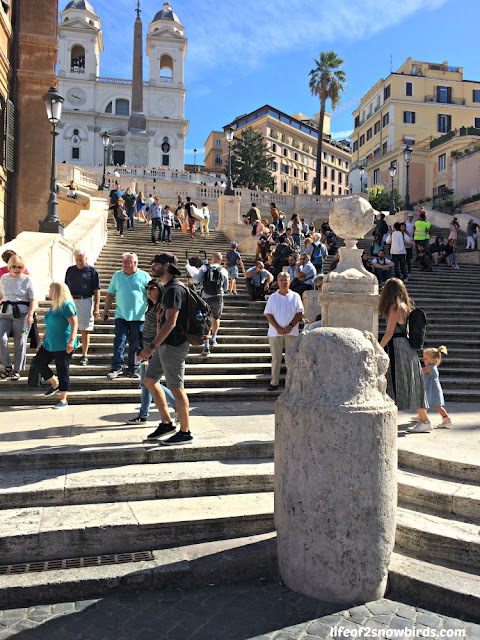 After taking a few quick pictures and throwing our euro into a dry fountain, it was having it's annual cleaning!, we took off running to the Spanish Steps. From the Spanish Steps we walked 30 minutes, along with many other tourists, to get to the Colosseum. If we had more time we would have liked to have gone inside. We'll have to go back one day I guess! 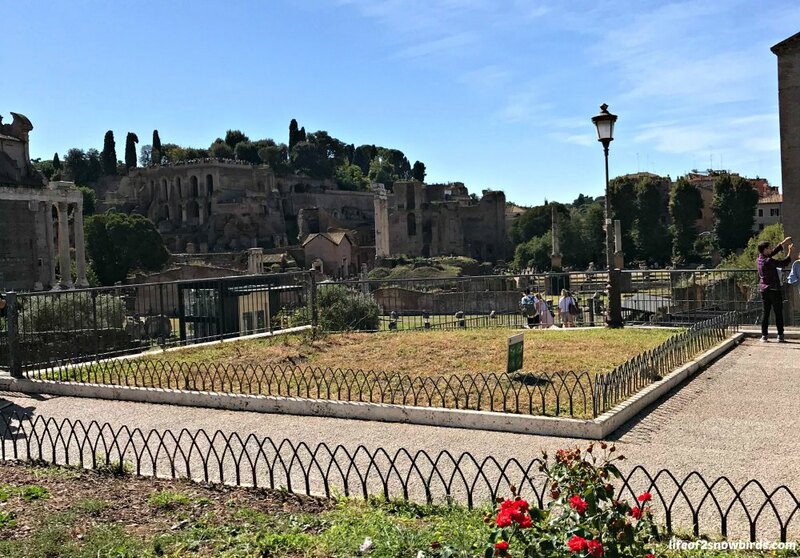 We are not complaining about the walk to the Colosseum, though, because we actually got to view a section of the Imperial Forum on the way. After the Colosseum, we wanted to see the Pantheon but we ran out of time. We didn't want to try to get into the Vatican Museum with a ticket that was expired like we did at the Accademia Gallery in Florence the day before. We got back to Vatican City, with a few minutes to spare, we headed into the plaza where the Vatican Museum was. We ran around trying to find the way in. We were having a hard time finding someone to ask for help. We finally found someone and he pointed to where we had entered the plaza. The entrance was down the long block we had just come from, and around the corner. We jumped on line even though we had tickets already and searched for someone to help us find the express line. Someone eventually approached us and told us to follow him and he would get us in. After following him for a very short time, we became suspicious of where he was taking us so we ditched him when he wasn't looking. We did finally find the express entrance and we were only a couple of minutes late when we did. We are not art experts so couldn't appreciate most of what was in the museum, but the ceilings were so gorgeous and it was so much fun to enter a room of the building and look up to see if we would be treated to a beautiful sight. 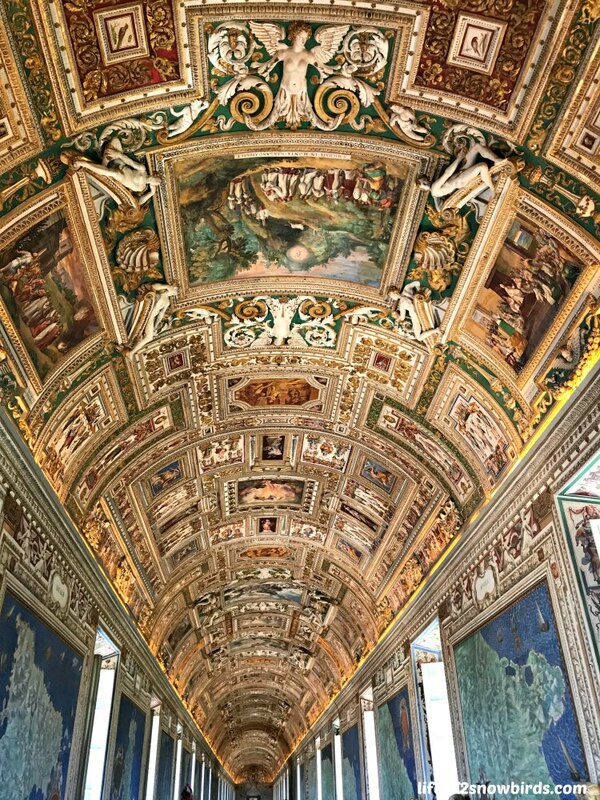 It got us very excited to see the amazing Sistine Chapel ceiling. We were not allowed to take pictures of Michaelangelo's masterpiece but it was a dream come true to see it. I couldn't believe that we were really there looking at probably the most famous painting found on a ceiling in the entire world. Especially the Creation Of Adam in the central panel. This is what I think of, when I am thinking of the Sistine Chapel painting. The hands of God and Adam reaching towards each other with their fingers almost touching. 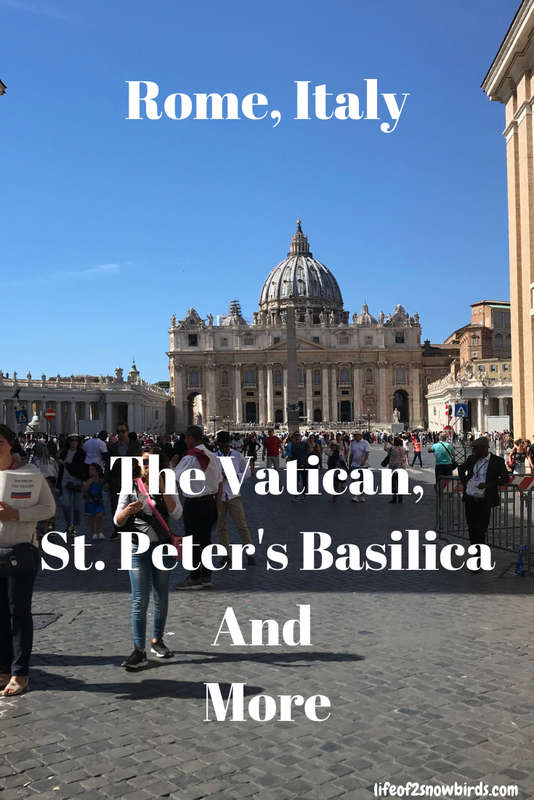 We read in Rick Steve's Mediterranean Cruise Ports guide that we could go directly to St. Peter's Basilica from the Sistine Chapel so that was our plan. We were to find a shortcut exit labeled "Exit for authorized guides and tour groups only." 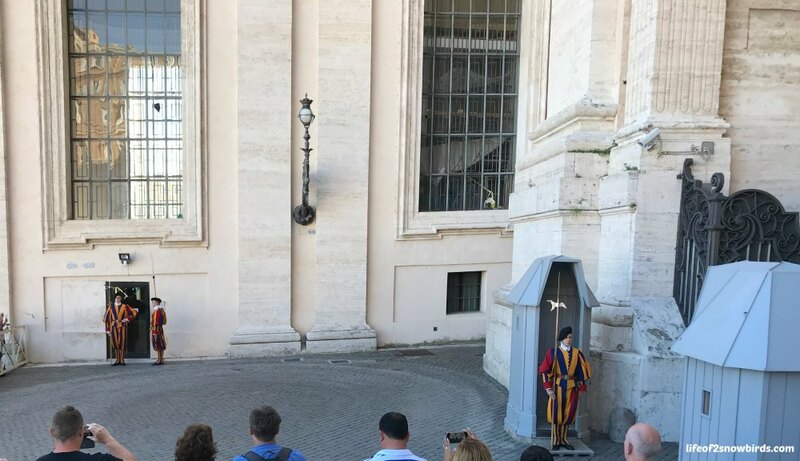 We found this exit at the far-right corner of the chapel and it brought us out into St. Peter's square. We passed the Holy Door as we made our way to the basilica. This door is only open during a holy year which occurs every 25 years. The last time the door was open was in 2000. 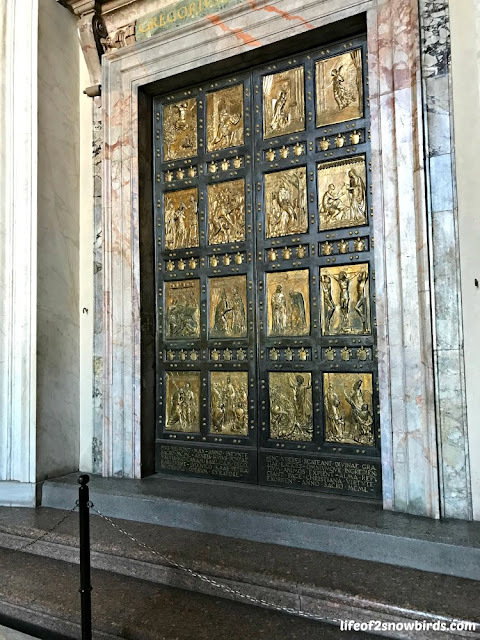 The door, covered by a brick wall inside the basilica, opens after the Pope strikes the wall with a silver hammer. Then we entered our last stop of the day. St. Peter's Basilica was the highlight of our day. We saved the best for last, though we didn't know that it would be. 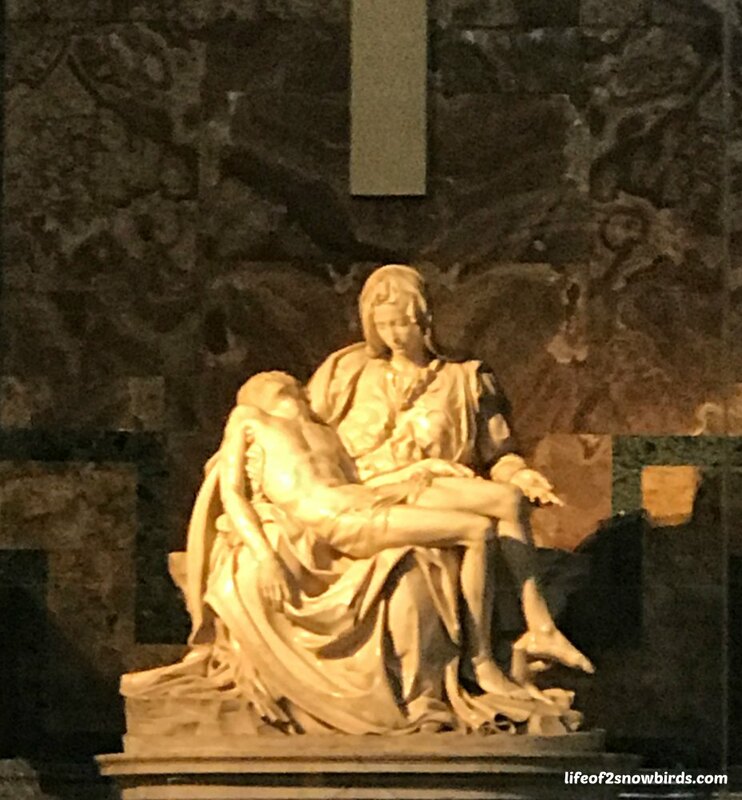 And we also didn't know how emotional it would be to see Michaelangelo's Pieta. We have seen pictures of it, the mother, Mary, holding her lifeless son, Jesus, in her arms, but seeing it in person brought it to life and made it so real and so sad. But after the sadness, was the joy of seeing it right in front of us! 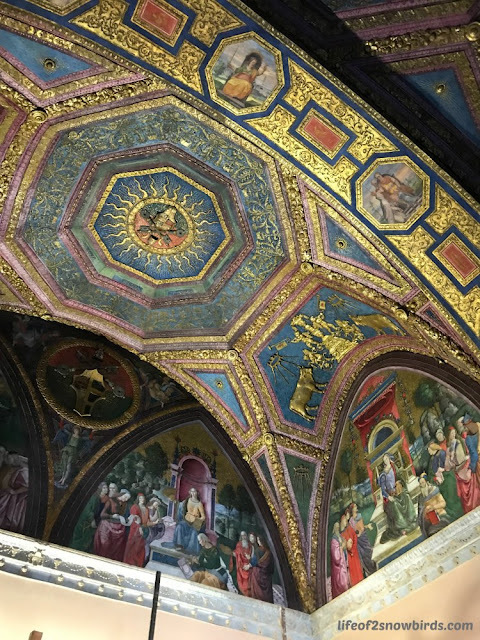 We were in awe of this gorgeous basilica and loved every inch of it. 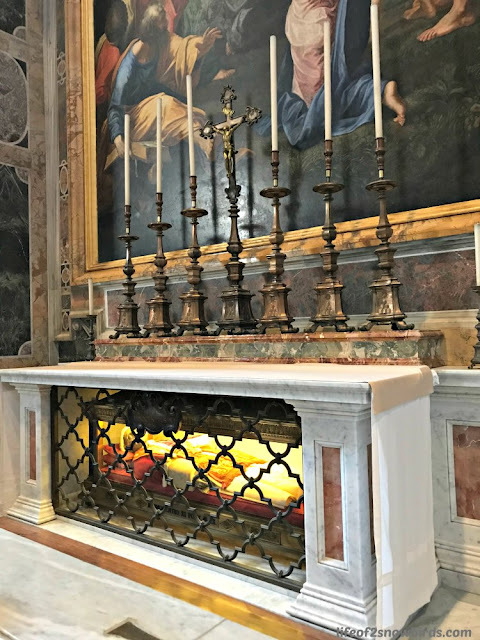 Something very interesting to check out in the basilica is Pope John XXIII's body laid out in a lighted glass tomb. Some say that it is a sign of a miracle that his body was completely intact after being buried for 38 years. 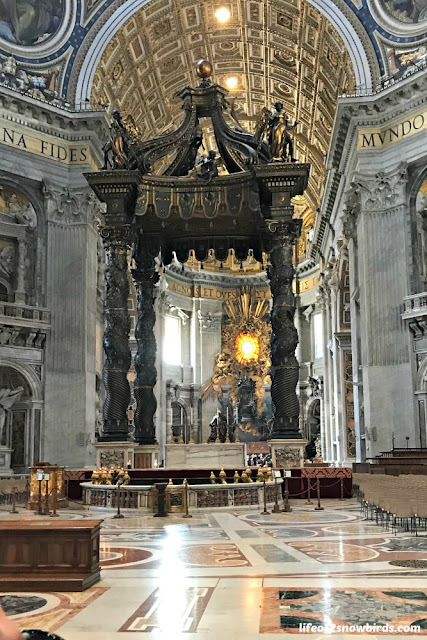 Because of the amazing condition of the body, the authorities decided to put it in the church for all to enjoy. Pope John XXIII himself performed a miracle when he cured an Italian man who had a stomach tumor. On the way out of the basilica we, passed the Pope's guards. We were lucky enough that we got there right in time to witness the changing of the guards. We weren't quite sure where we were supposed to meet our tour guide so we made sure we left the basilica with time to spare. When we got to where we thought we were supposed to be, we met a lovely older couple from Belfast, Ireland who were as confused as we were as to where we were meeting our group. They just got back from walking to the sights that we took the bus to see. We were very impressed. We told them all about our plans to visit Ireland in a couple of months and they were very happy to let us know what we must see. They told us about the many vacations and cruises they have taken since they retired. They took a break, though, when they started feeling their age but realized how short life is when the healthy husband suddenly needed 7 stents put into his heart and this was the reason they were vacationing again and on this Mediterranean cruise. An English couple approached us as we were talking to the Irish couple. They were new cruise friends of the Irish couple. We started a conversation about how a fellow cruiser was left in Pisa the day before. The English couple told us about their first cruise, this was their second, when they went to Israel. The ship they were on abruptly took off 2 hours early and left 4 people behind when fighting erupted in Jerusalem and the government told the ship to leave immediately. I can't even imagine the stress the 4 people experienced that day. I hope they got out of there ok.
We were almost the group of people our fellow passengers would be talking about that night. We were so involved in our conversation, and standing in the wrong spot, that we nearly missed our group leaving for the train station. On the train ride back to the ship, we sat with a couple from Australia. I immediately announced that I might fall asleep on them but then we started talking and we were having such a nice time with them that it would have been fine with us if the bus trip back was even longer than it was. Having just retired from working as a pre-school assistant for the last 17 years, I was very jealous of the perks teachers are offered in Australia. 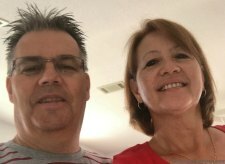 The husband and wife were both teachers and mid-way through a 4 month vacation. I wondered how they could manage to leave their students for 4 months. I know we were not allowed to take vacation during the school year at our pre-school. They explained that in Australia, after 10 years, teachers can accumulate time off. The husband had enough time to take 6 months off and she had 4. When they started making plans for this hiatus, they booked the Mediterranean cruise first and then planned the rest of their European vacation around it. We had a great time talking about their vacation and then we told them how Australia was on our bucket list. 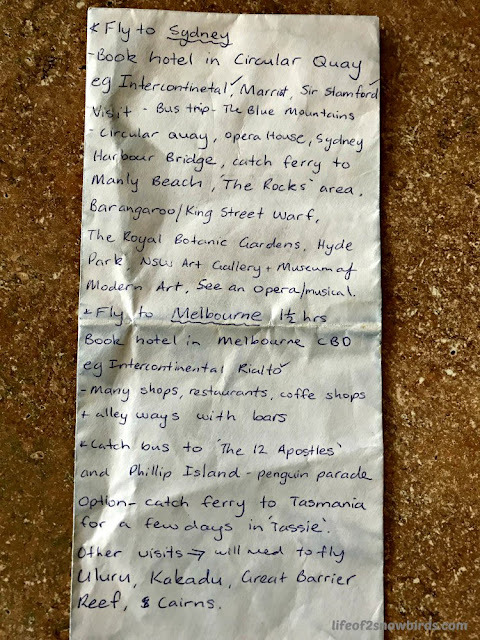 (Read about Australia and other places on our bucket list here.) We had never met anyone from Australia before and it was great to have someone answer all our questions. But I was very disappointed to learn that we would not see koalas running across anyone's lawn. I had heard that or read that, somewhere, but I guess it was "fake news." Also, we found out that we need to book a tour through the outback if we want to see any kangaroos. They were so wonderful about answering all our questions and giving us ideas of what we might want to put on our Things To Do In Australia list. A couple of days after our visit to Rome, Soko ran into the couple and they gave him this list they prepared for us. You really can meet some of the nicest, most interesting, people on a cruise! My sister just experienced a terrible accident in her home and she is not able to go back to her house, at the moment, because of it. Thankfully she was in her home when it happened. (Read more about it below.) 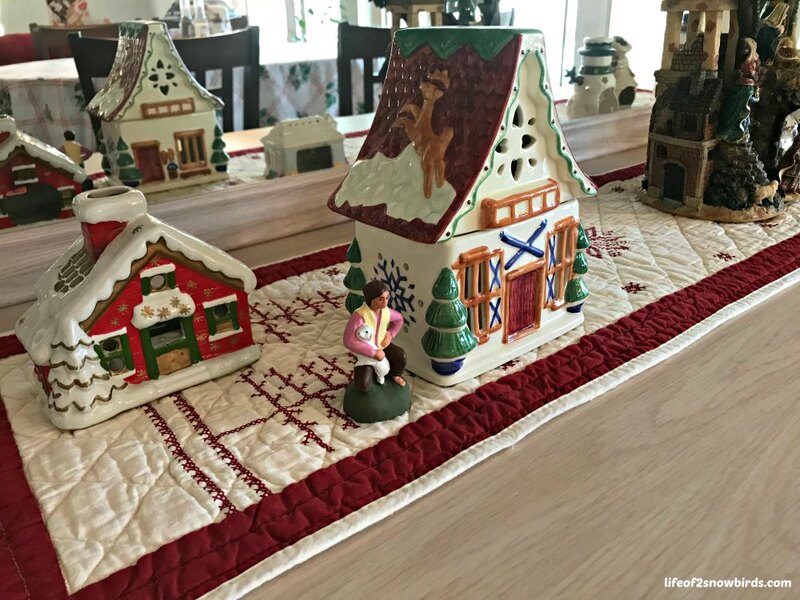 Because of this incident, we thought it would be important to make a list of things to check before we leave our home in North Carolina, and our snowbird home in Florida, for vacations and especially when we are leaving the homes for the season. Turn off water. We heard one too many stories from friends and family about how they have come back to a flood in their home from either their washing machine hose breaking or one of their water pipes bursting from water freezing inside it. The water shut off valve in Florida is easy to get to and we always shut it off before we leave for the season. The one in our North Carolina home is harder to get to so it's tempting not to shut it off, but then we think about what could happen if we didn't. Unplug televisions, computers and other electronics. We keep our central air on in Florida when we leave our snowbird home to prevent the house from becoming too humid. A humid home is what Florida bugs and other critters love and we don't want to come back to our house and see the little squatters all over the place. So we leave the electric on but unplug things we don't want to lose, in case of an electrical storm which happens quite often during the summer months in Florida. We are not confident that our small surge protectors will protect our costly televisions and computer during a bad storm. We have just learned, though, about a whole house surge protector that we are considering. This would give us piece of mind when we are leaving our Florida place for the season or even for a short vacation. American Electric of Jacksonville (which is located in Jacksonville, Florida) knows all about the headaches the weather in Florida can cause. Master electrician, Mike Murphy, is the person to call for a free quote on getting a surge protector installed. Make sure to check that small and large appliances are off. The picture above is of my sister's dryer. She is now displaced and living in a hotel room for an indefinite amount of time. Luckily she and her husband were at home when this happened. Her husband smelled something burning and ran to get the fire extinguishers. They called 911 when they realized the fire was electrical and would need more than small extinguishers to put it out. 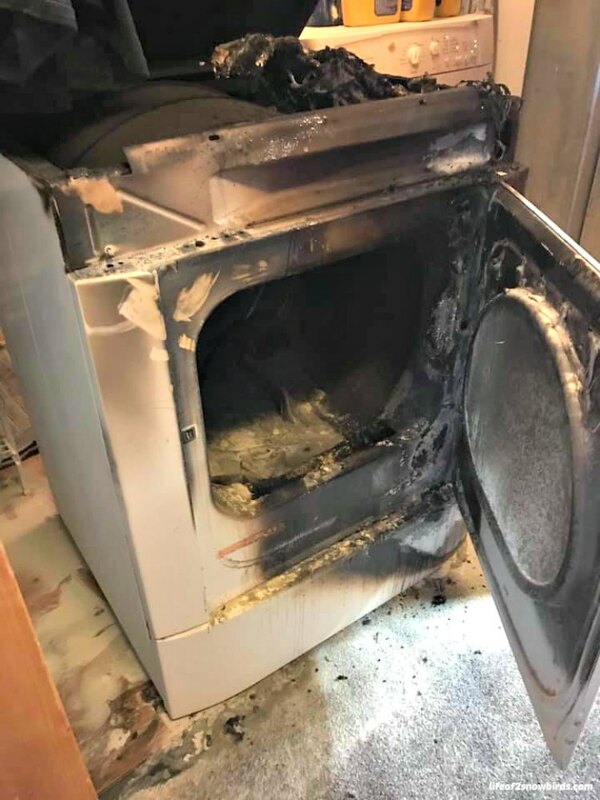 We can only imagine what the result would have been had they left their home with the dryer on. We had an experience once that could have had a disastrous ending. I always worried, as we pulled out of driveway, that I may have left something on and I did. 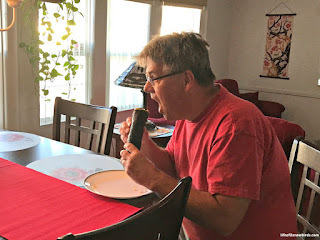 I had a very strong feeling, as we were leaving for vacation, that I might have left the iron on and made my husband turn the car around and go back to the house. I was right! Now it is part of our routine, before we leave the house, to double check that all appliances are off, and some we will even unplug. Put a quarter in your freezer. How is that going to keep my house safe you ask? 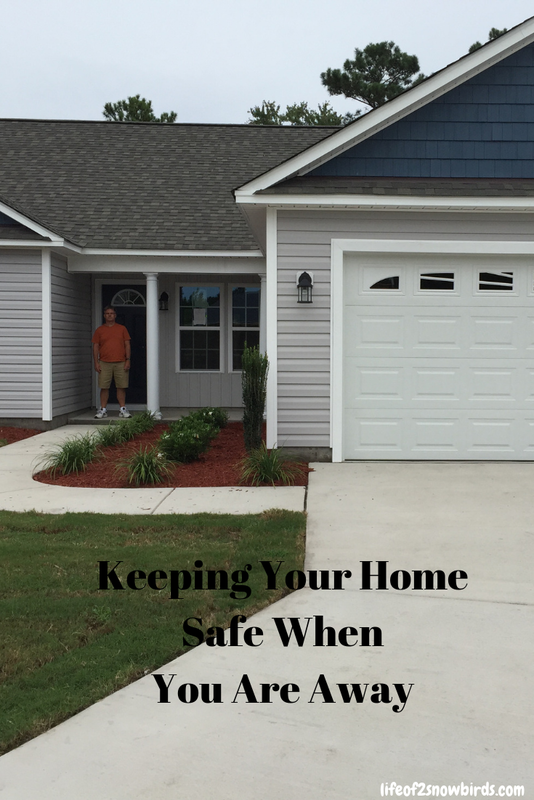 It might not keep your house safe but it will keep you safe. We returned to our home in North Carolina, from a vacation, three days after Hurricane Florence hit our area hard. (Our harrowing journey to get back is a blog post I will have to write one day!) We saw signs that there might have been a power outage but didn't know for sure as the power was on when we returned home. Putting a quarter on top of a frozen cup of water will answer your questions of whether there was an outage or not and for how long. If you find the quarter at the bottom of the cup, you'll know that the power was out long enough for the ice in the cup to melt completely and your food to be, most likely, unsafe to eat. If it is in the middle of cup then, yes, the power did go out but probably not long enough for your food to spoil. Check to see if your windows are shut and locked. We always made sure our doors were shut and locked when we left the house, but not always the windows. Unfortunately, we had an incident, many years ago, when we left our window open. Someone, I'm pretty sure we know who, only had to cut small openings in the window screen to be able to get to the latches, open the screen and get into our home and take the cash out of an envelope I had in a kitchen drawer. Why give someone easy access into your home like we did? Stop your mail and newspapers from coming to your home. Having an overstuffed mailbox and newspapers scattered all over your driveway are signs that tell everyone you are not home. Leave lights on. Does anyone sit in their home in complete darkness every night? We leave a light on inside the house to make it look like we might be home. We keep talking about getting a timer for our lights so they don't have to constantly be on but it is one of those things that we think about, forget, then remember as we are walking out the door. We also have solar lights outside to help deter someone from approaching and entering our home. On our list of things to do, we have getting electric lights installed outside that will be controlled with a timer. American Electric knows all about lighting for safety and for enhancing landscaping. Let someone you trust know that you will not be home. It is a good idea to let your trusted neighbor know when you are leaving for vacation. If we know our neighbor is not home we will throw his newspaper closer to his front door if he forgot to put his newspaper subscription on hold. Fortunately for us, we have our daughter, who lives two doors away from us on our cul-de-sac, watching our North Carolina home when we are in Florida and our cousin, our aunt and our neighbor George, watching our home in Florida when we are on vacation or back in NC. We are so grateful to all of them for their watchful eyes. Do you have any things on your checklist for keeping your home safe when you are away that we have missed? 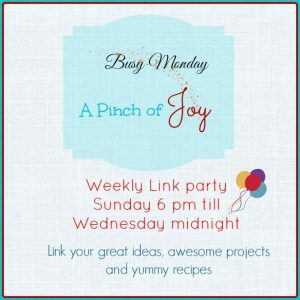 Please leave us a comment and we will gladly add your idea to our list. Thanks! One of the things that make our vacations so much fun, especially when we are in a foreign country, is trying the local cuisine. We definitely had a great time sampling delicious Irish meals on our recent trip to Ireland. 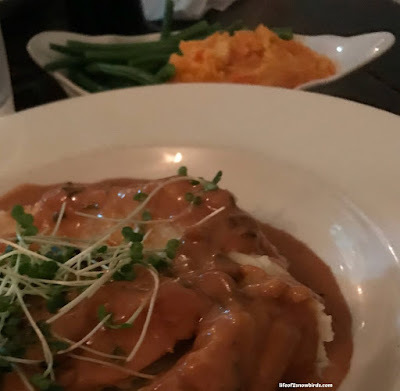 We ate our first and last meals at Gus O'Connor's Pub in Doolin, the town we stayed in for the week. Both meals, plus breakfast a second time there, were authentic Irish cuisine, and absolutely wonderful. It was when we ate there for dinner that we were served something I couldn't stop thinking about when I got home and had to try to replicate. All I knew from the menu, when I ordered my dinner, was that I would be getting a vegetable. My side dish of vegetables actually was in it's own little side dish. I recognized the green beans but didn't know what was beside them. I knew they tasted amazing though. I asked the waitress what I was eating and she said it was carrot and parsnips seasoned with salt, pepper and honey. I have to say, my first attempt at copying this recipe was surprisingly very good! So, I would love to share it with you so you can enjoy it as much as I did! 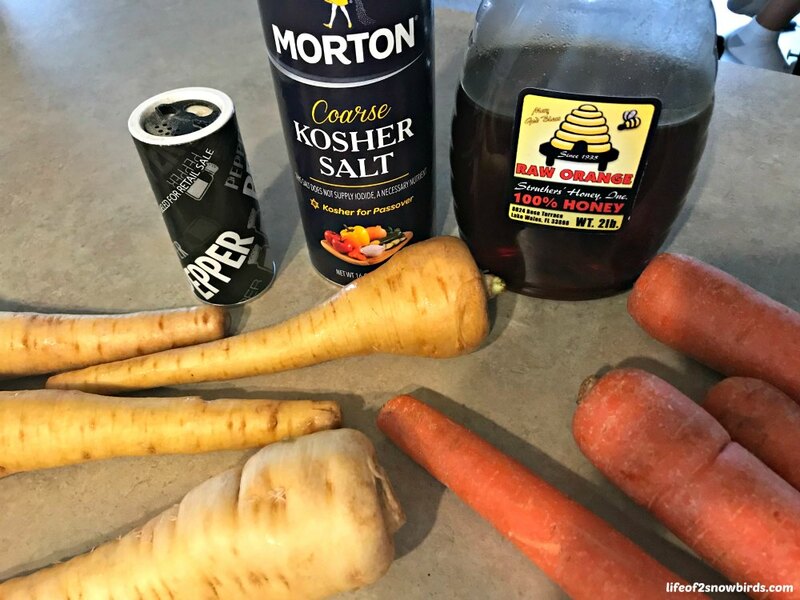 Steam peeled and sliced carrots and parsnips for 8 minutes. 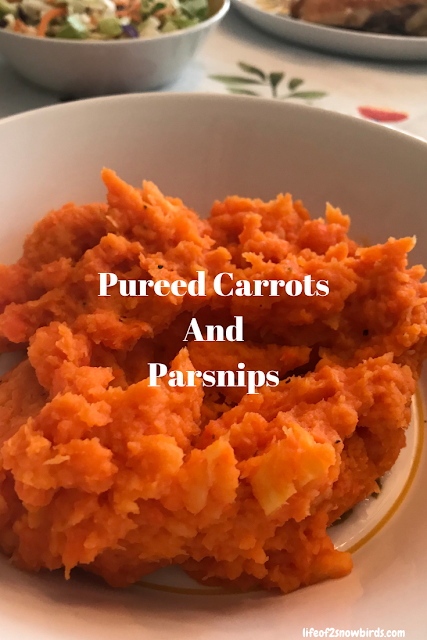 Transfer pureed vegetables into a medium saucepan and stir in honey, salt and pepper. Cook on medium heat until warm. 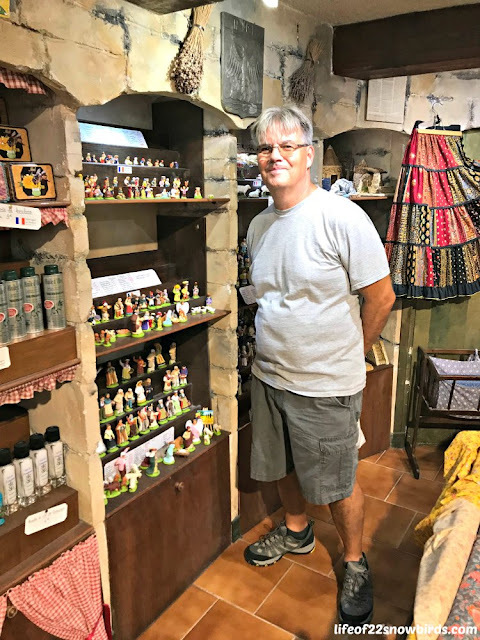 We loved Spain and France, the first two countries we visited on our Mediterranean cruise vacation. Now it was time for our ship to take us to Italy. This was the country we were going to spend the most time in and our first port in Italy was Livorno. As was the case for most of the cruise, our ship docked in a smaller city leaving us to research our options for getting to where we wanted to go from there. For this leg of the trip, we booked an excursion through the cruise line because we wanted to see both Florence and Pisa and it was just easier to get to both with a tour. What we really didn't want to miss out on seeing, while we were in this area, was Michaelangelo's David at the Accademia. We were happy to know that we would be able to obtain our tickets in advance, online, and, thereby, would not have to wait in a 2 hour line. We only had 4 hours in Florence so we didn't have 2 hours to spare. When you order tickets online, you have to reserve the date and time that you would like to visit the Accademia. 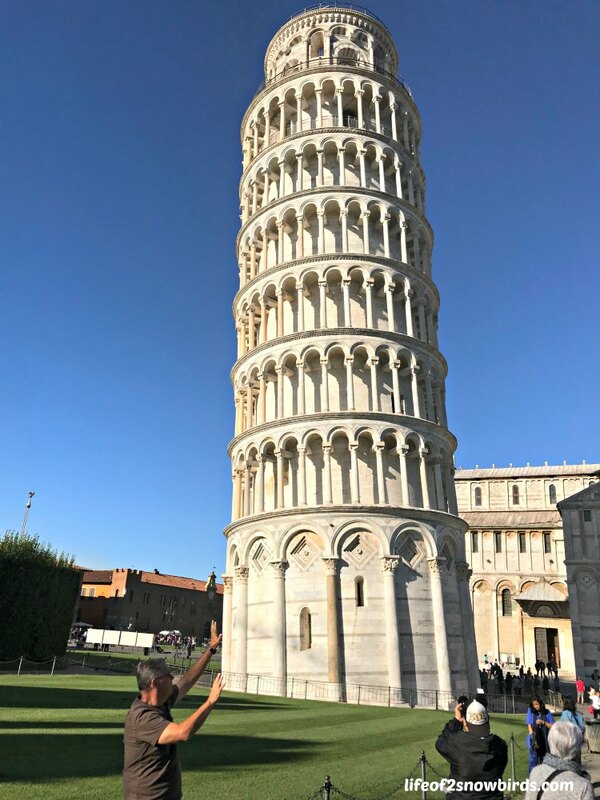 According to the itinerary of the excursion we booked, it said we would have 4 hours in Florence and have one hour in Pisa. 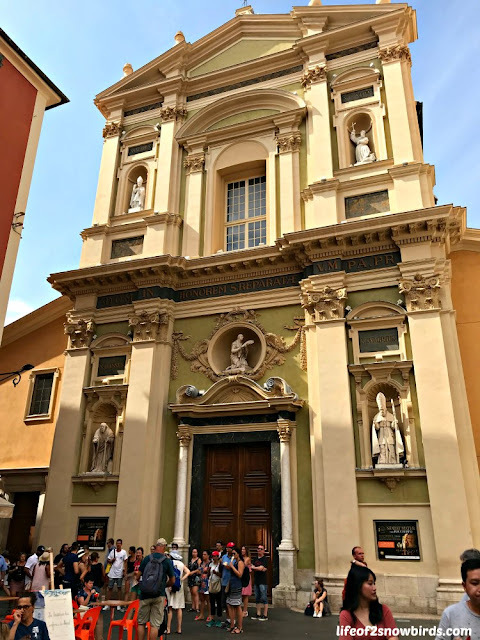 We were being picked up at our cruise ship at 8:00 am so we ordered our tickets for 10:00 am giving us time to travel to Florence and then find our way to the museum. We couldn't believe it when the tour guide announced that we would be going to Pisa first then to Florence! 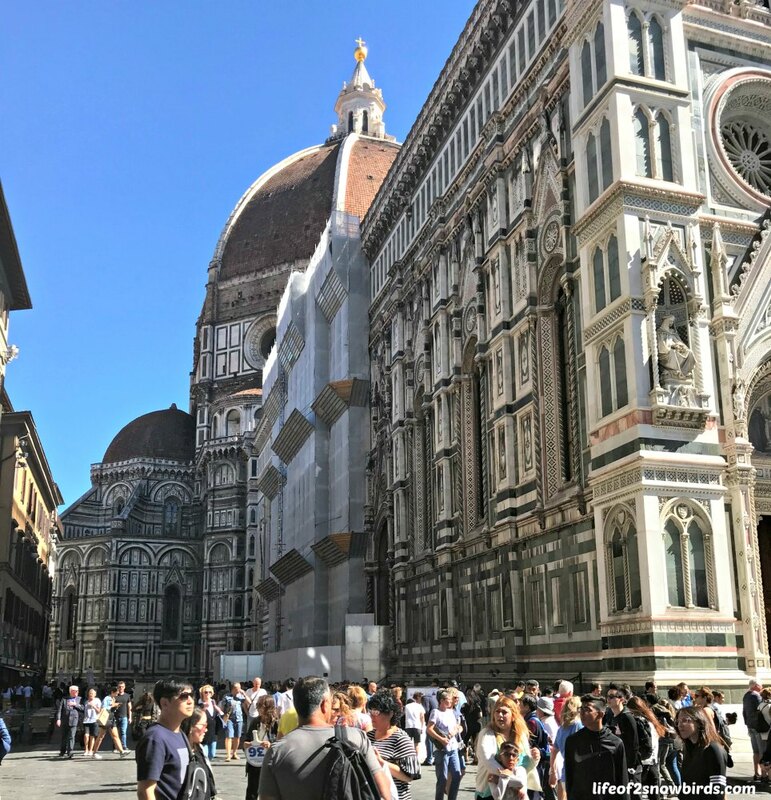 I assumed that we would go to Florence first since it was listed first and we found out that that is usually the case, but not today. Well, it was only 8:00 am and we would only be spending 1 hour in Pisa. 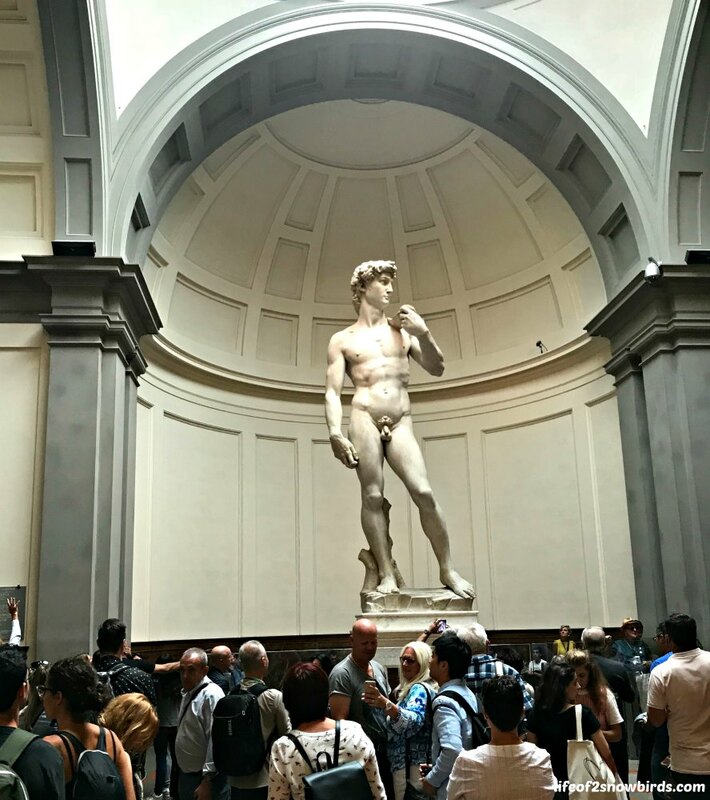 We had some hope that we would make it to Florence in time to see David. So off we went to Pisa where we had to take the very cheesy, but must-do, picture of us holding up the tower. This is not an easy picture to take we found out. I took several of Soko and he took a bunch of me. It was really hard to find a place to stand near the tower, first of all, because there are so many people trying to do the same thing, and then we could not find the right angle. The picture below is the only picture that came kind of close (but not really) to what we were hoping for. I am now very impressed when I see a great picture of someone holding up the tower! 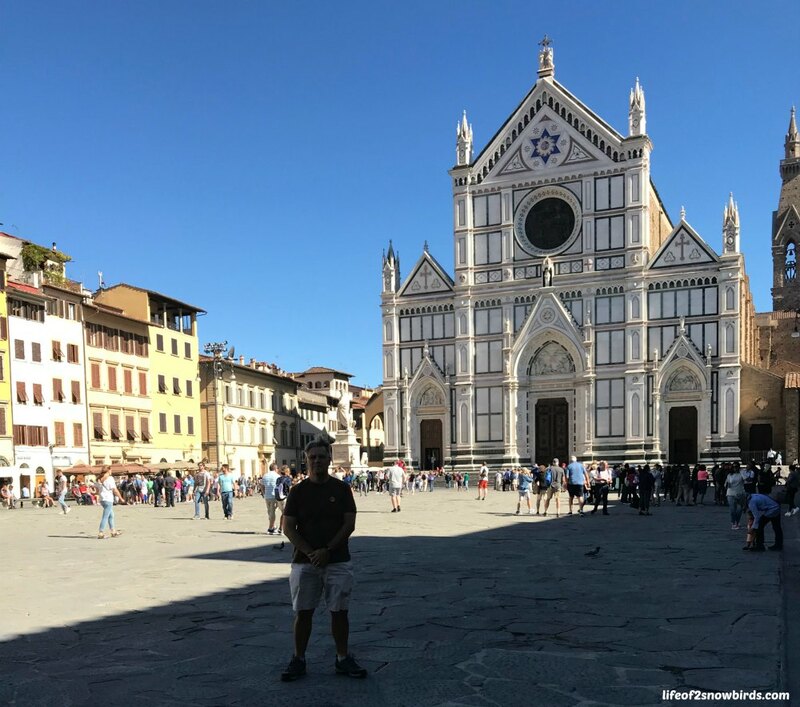 I would have loved to round up our tour group, after taking our picture, to get them into the bus and on to Florence, but that wasn't happening so we checked out the two other buildings in this small area which is called the Field of Miracles square. 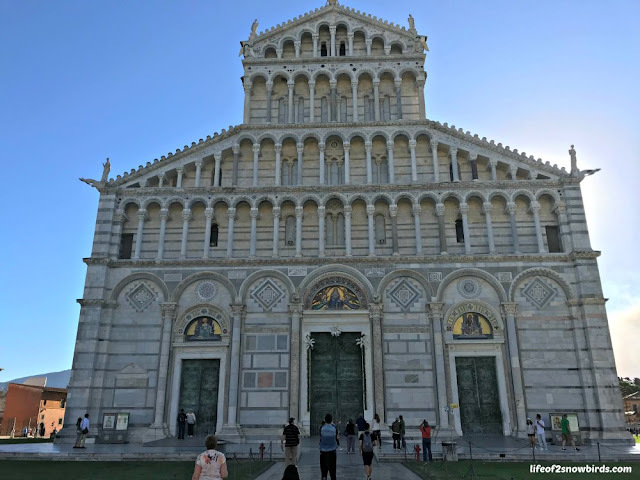 The Pisa Cathedral was gorgeous but the main attraction on this building was the amazing bronze doors that tell the story of the life of Jesus. 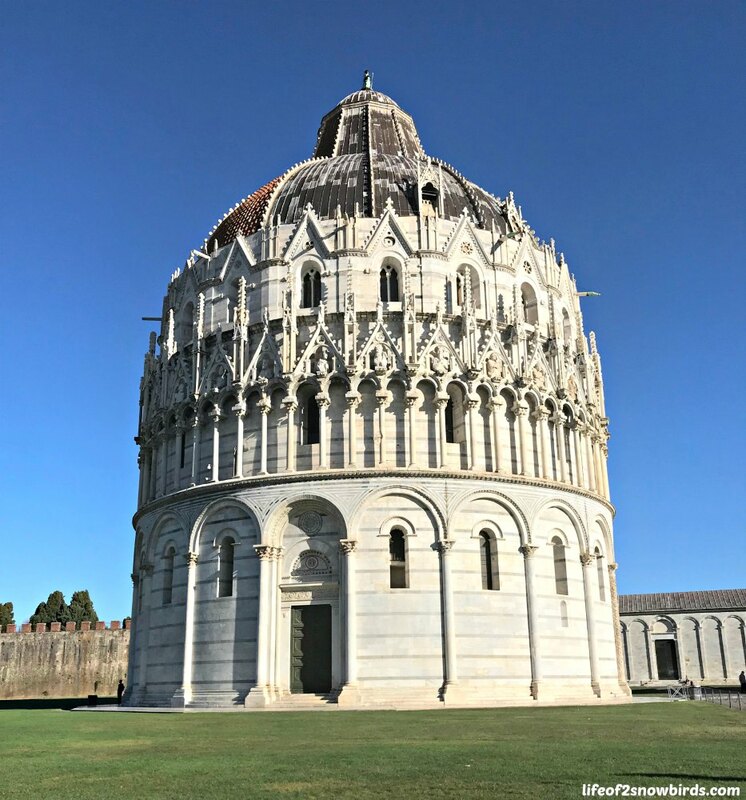 The Baptistery here is the biggest in Italy and was another beautifully detailed building. It was finally time to meet our group to get back on the bus and off to Florence. It was not quite 10:00 am yet. We had no idea how long it would take us to get to Florence but there was still a chance that we would not be there too much after 10:00. But, no, one of our tour passengers did not show up at our meeting place. We were waiting so long for the latecomer that another one of our fellow passengers got so tired of waiting that he decided to head back to the bus and offered to lead the way for anyone who wanted to join him. Everyone decided to follow him back. You could hear our tour guide calling out "Is no one going to wait with me?" She eventually left the Field of Miracles without our fellow cruiser and he had to find his own way back to the ship. 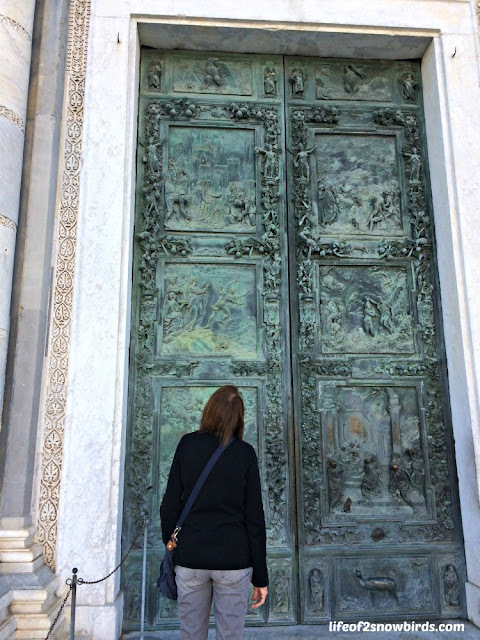 As soon as we got off the bus in Florence, me and Soko started running toward the Accademia . It was on the opposite side of the town. By the time we got to the building we were almost 2 hours late. Out of breath and totally stressed, we ran to a gentlemen who was directing the many people who were waiting on a mile long line to get in to see David. I showed him our tickets and explained what happened. He was so kind and told us not to worry. He told us to go across the street to a small storefront to exchange our receipt for a ticket then come back to the shorter line and we would be in in 10 minutes. The person at the storefront was not so kind at all and was very annoyed that we were so late. She told us she would issue our tickets, which had 10:00 as our entrance time, but really didn't think we would get in. We ran back to the fast pass ticket line but the nice gentlemen was gone! We got on line anyway and got past someone who barely looked at our tickets as we entered the building. Just when we thought we were home free, we noticed a ticket taker at a booth. We were thinking, this is where we finally will be told our tickets were no good and we would have to wait on the 2 hour line. But then, we couldn't believe it, we recognized the person at the ticket booth. It was the kind gentleman that we met outside. 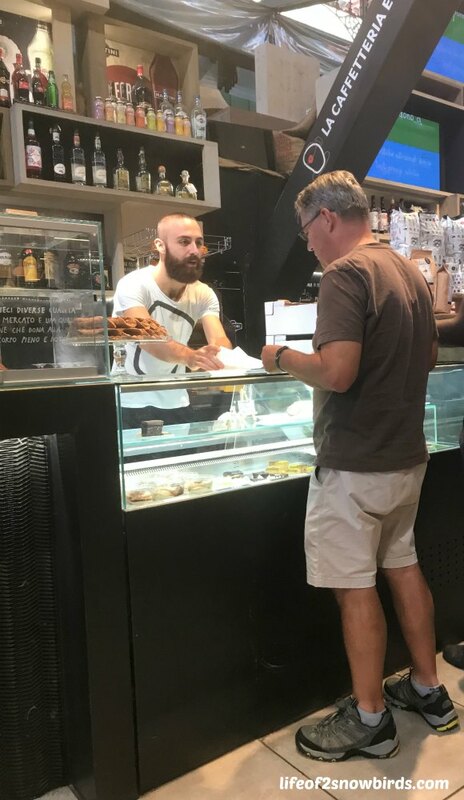 He recognized us and gave us a huge knowing smile and told us to enjoy our time. So the moral of this story is, buy your ticket in advance, if you are pressed for time, even if you don't know exactly what time to order them for. Not too far from the Accademia was a food court, Mercato Centrale, that we wanted to have lunch at. We read about the tremendous food market on the lower floor with restaurants on the upper. 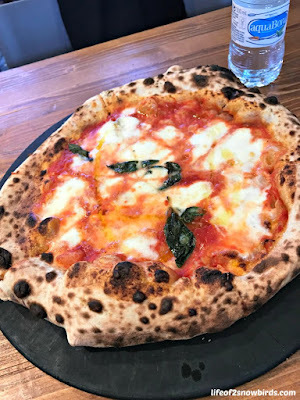 We had really good pizza here and the best, (freshly made), cannoli I have ever tasted in my entire life! After lunch, we had a very small amount of time to see the rest of the sights on our list before we had to get back to where our bus dropped us off. We pretty much had to run to each sight, take a quick picture, then run to the next one. The first place we ran to was the Plaza di San Giovanni, where we saw the magnificent Duomo, Santa Maria del Fiori, and the adjacent Campanile and Baptistery. 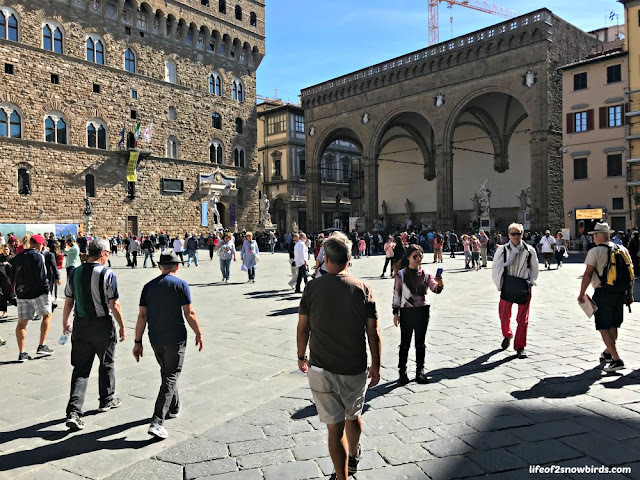 From here, we skipped a few sights we had planned to check out because we were running out of time and I didn't want to miss seeing the Piazza della Signoria where a replica of David stands in place of the original that once stood there. If you look closely, you can see it next to the doorway of the building on the left. Also in this plaza is an open-air sculpture gallery, Loggia de Lanzi. 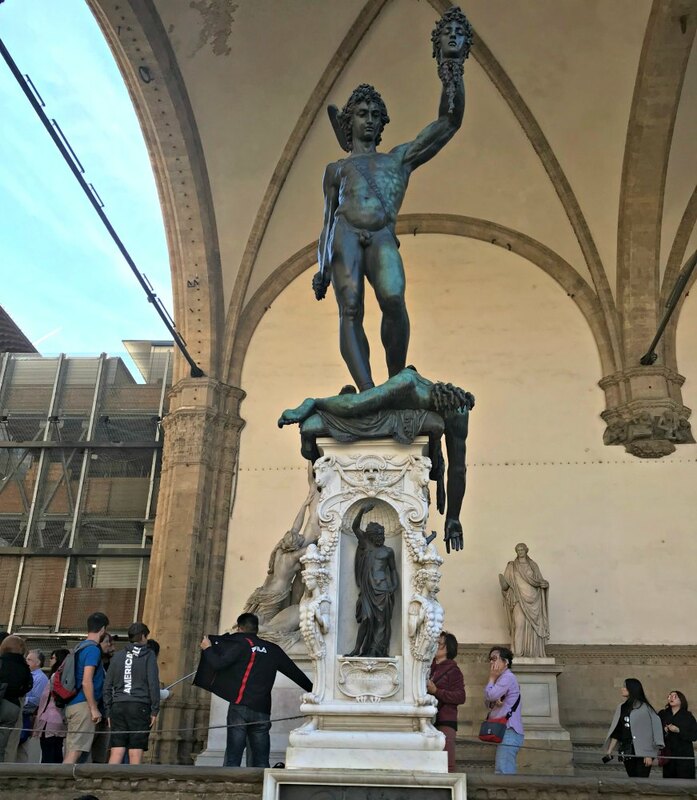 We read that there were many statues here and we especially wanted to see the one of Perseus holding Medusa's decapitated head. Hey, it's not everyday you see something like that! We spent a good amount of time at the plaza but it was time to start heading back. I didn't want us to get left behind like the person who got left in Pisa so we skipped a couple of more sights and rushed back to our meeting place, the Piazza di Santa Croce where the beautiful Church of Santa Croce stands. 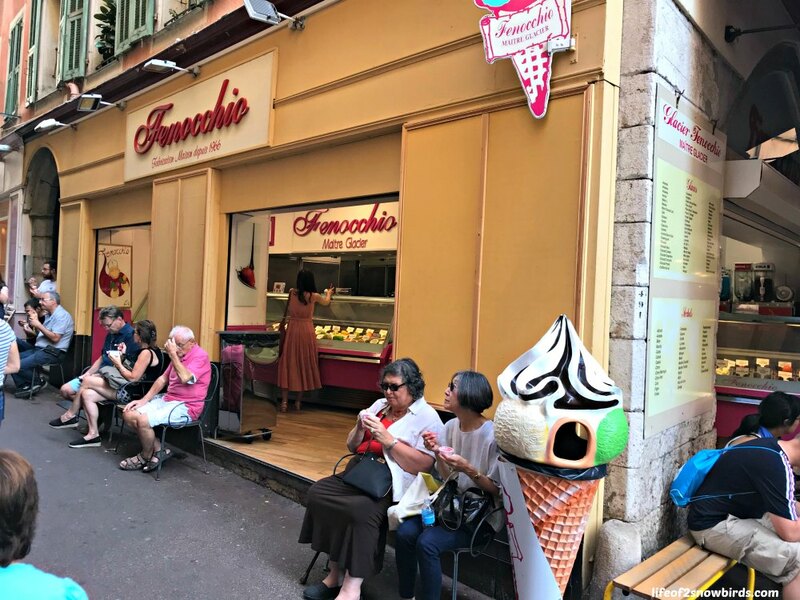 We got back with time to spare and were even able to enjoy a gelato as we waited for our tour guide to come pick us up to bring us back to the ship. We took one last picture of the beautiful city of Florence as we drove away on our tour bus. There were a few sights we had planned to see that we didn't even get close to and many buildings we wanted to go inside but didn't get a chance to. I guess we have just have to plan another vacation to Florence, Italy! My mom was Japanese. That meant that half of our family lived in Japan. And lucky for me and my sisters, we spent entire summers living in Japan. Because of that, I get so homesick for my second home, when summer arrives each year. I miss our family and friends, the lifestyle, the celebrations and the food that we eat as we celebrate. Although, we can't travel to Japan for every holiday, we can celebrate and keep the traditions alive in our homes here in the US. One of our favorite holidays is Setsubun because we can eat one of favorite foods, futomaki. Setsubun is celebrated one day before the start of spring, which in Japan is February 3. One custom that is practiced during this holiday is throwing roasted soybeans. You throw beans inside the home, usually at a family member who is wearing a demon mask and running around the house, to chase away any demons. After the bean throwing, you have the bean eating. Everyone eats the amount of beans that corresponds with their age. Without revealing my age, I can tell you that if I had to eat that many beans, I would never be able to eat the delicious futomaki after! So, needless to say, we skip , this part of the celebration. After the bean throwing fun, comes the eating! I would like to share our recipe for futomaki. It is called ehomaki when made to eat for Setsubun and should contain 7 fillings. The 7 fillings represent the Seven Deities of Good Fortune. They can be any filling you choose. 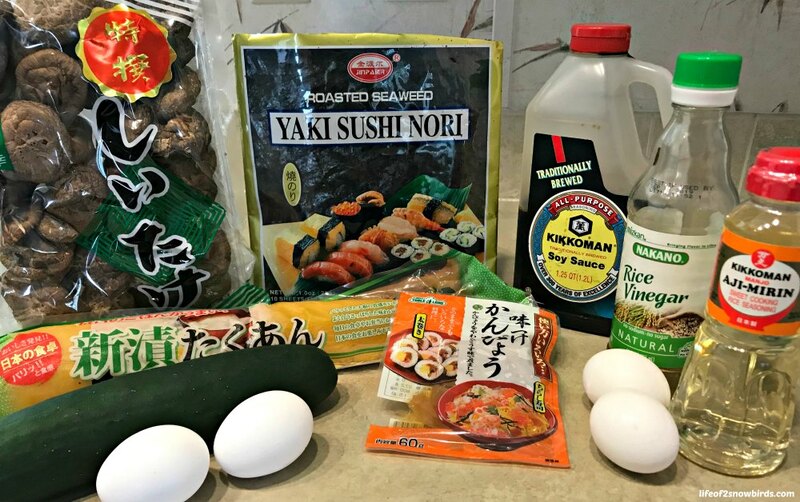 Our recipe has only 5 but you can add shrimp, imitation crab meat or a number of other ingredients if you want your roll to be officially Setsubun ready. 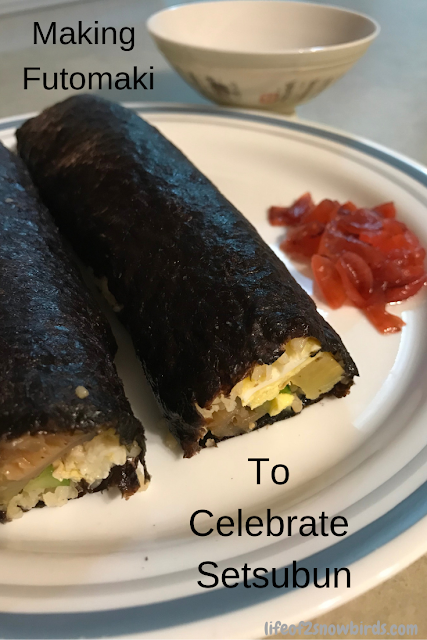 There are a couple of things you need to know first though before you make and eat your own futomaki, if you are making it to celebrate Setsubun. You must keep the roll whole and not sliced like you would see it in your favorite sushi restaurant. 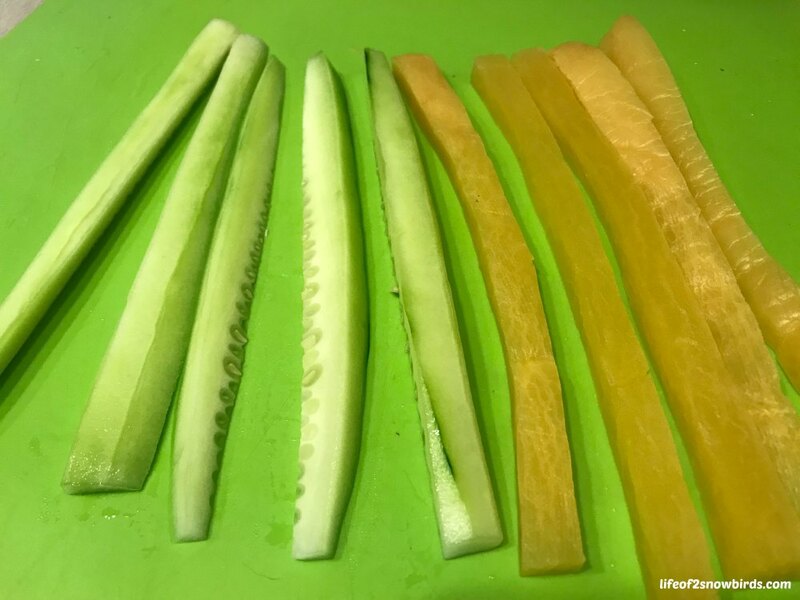 If you slice your roll, you will be slicing away good luck. Next you will have to face the lucky direction which this year was east northeast. (You can find the direction of the year and more information about Setsubun here.) Then you will eat your futomaki in silence as you contemplate the events of the past year and look forward to enjoying the new year. If you eat your futomaki correctly, you will have good fortune. Cool rice. Mix 2 Tbs. sugar, 1/3 cup rice vinegar and a dash of salt in a medium bowl. Add and gently mix in cooled rice and set aside. Soak mushrooms in 1 1/4 cup water. Do not discard water. After mushrooms soften (about 30 minutes) squeeze out excess water from the mushroom into the water they were soaking in. You should have about 1 cup of water. Add 2 Tbs. sugar, 1 Tbs. mirin and 1 Tbs. soy sauce to the water. Pour the flavored water into a frying pan. 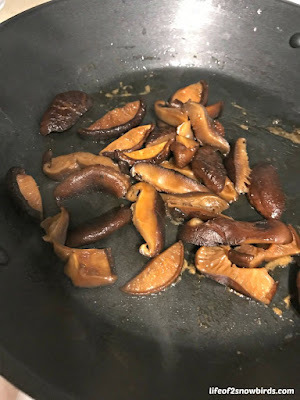 Slice the mushrooms (discard the stems) and add them to the frying pan. Cook mushrooms, stirring occasionally and watching carefully, until there is no more water left in the pan. Set cooked mushrooms aside. Break 4 eggs into a bowl and mix together with 1/2 Tbs. mirin, 1 tsp. sugar and 1/4 tsp. kosher or sea salt. Spray frying pan with Pam or use a small amount of oil if you prefer. When pan is heated, add a thin layer of egg, rotating pan to spread egg over entire bottom of pan. 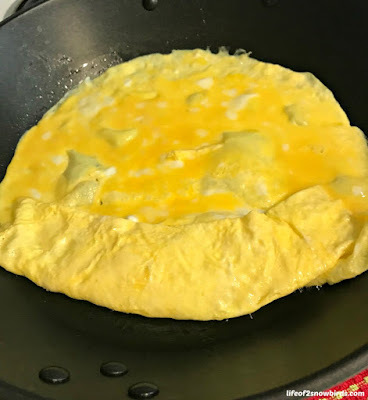 When egg is almost cooked, but still wet, fold one edge of the egg over about an inch or two and and keep folding until the egg ends up on the opposite side of the pan. 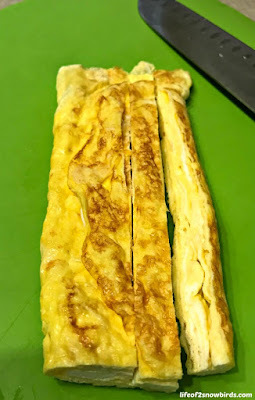 Add another thin layer of egg and when egg is cooked as before, fold the folded egg over the new layer of egg. Continue cooking the egg in this manner with the remaining egg. Allow tomagoyaki to cool, then slice into approximately 1/2 inch wide and the length of the seaweed sheet. One 2.1 oz package of prepared kampyo. You can find this in the freezer or fridge of your favorite Japanese supermarket. 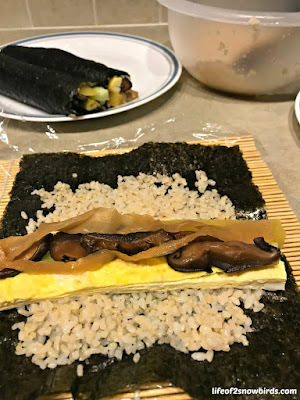 If you find dried kampyo, or prefer to use it dried, follow the same cooking directions for the mushrooms to prepare the kampyo for your roll. Slice the pickled radish to about 1/2 inch by 1/2 inch thickness and the length of your sushi nori (seaweed sheet). Slice the same as the takuwan. Place the sushi nori on a bamboo mat made for sushi rolling. 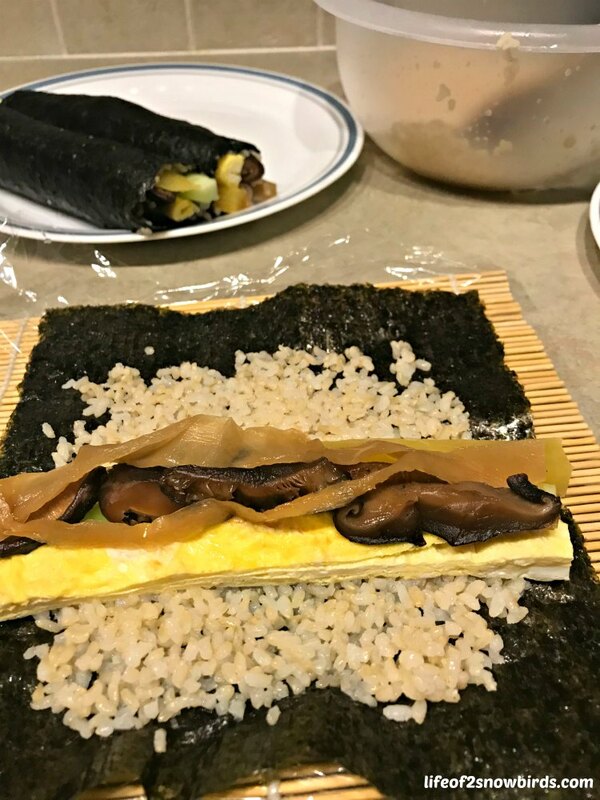 Spread rice over your seaweed sheet to about an inch from the edge of the top and bottom of the seaweed. Place the prepared ingredients side by side on top of the rice. Now you are ready to roll your futomaki. It is very hard to describe how to roll sushi and I haven't made a video to demonstrate this technique. I would like to direct you to where I was directed by DIL Nicole. Yuko and Noriko from Japanese Cooking 101 helped me roll my first futomaki! Go here for their tutorial. We boarded our cruise ship in Barcelona, Spain. Barcelona was amazing, by the way! (Read about our visit here.) We were happy we decided to spend two days there while we waited for the ship that would take us on a vacation we have been looking forward to for many years, a cruise around Europe. 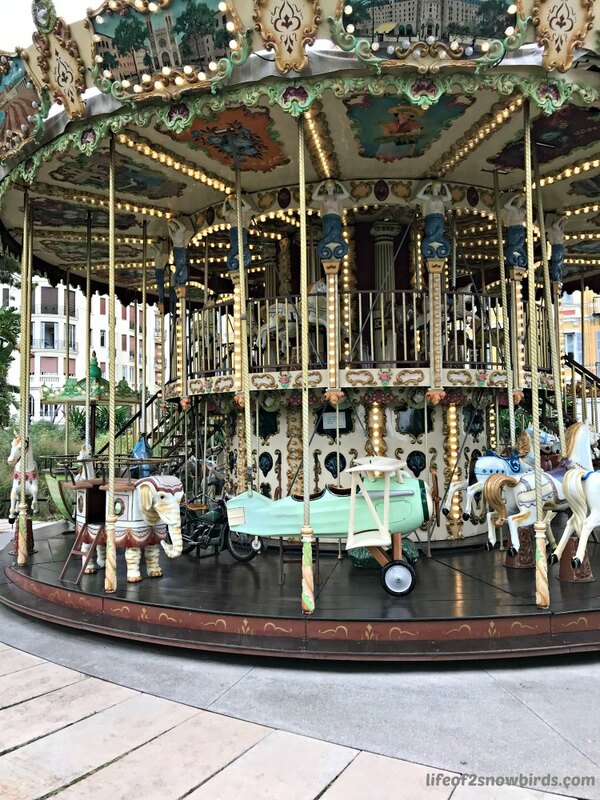 Now, it was time to get on the ship and get excited for our first stop, Nice, France. 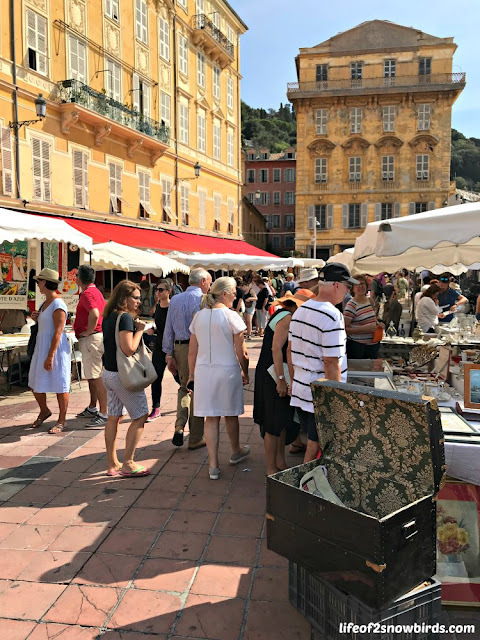 The first port, on our cruise itinerary, was actually described as Nice (Villefranche) France. Villefrance was actually our port but it is a very small town so I guess since Nice was so easy to get to, and more well-known, the port was listed as Nice. 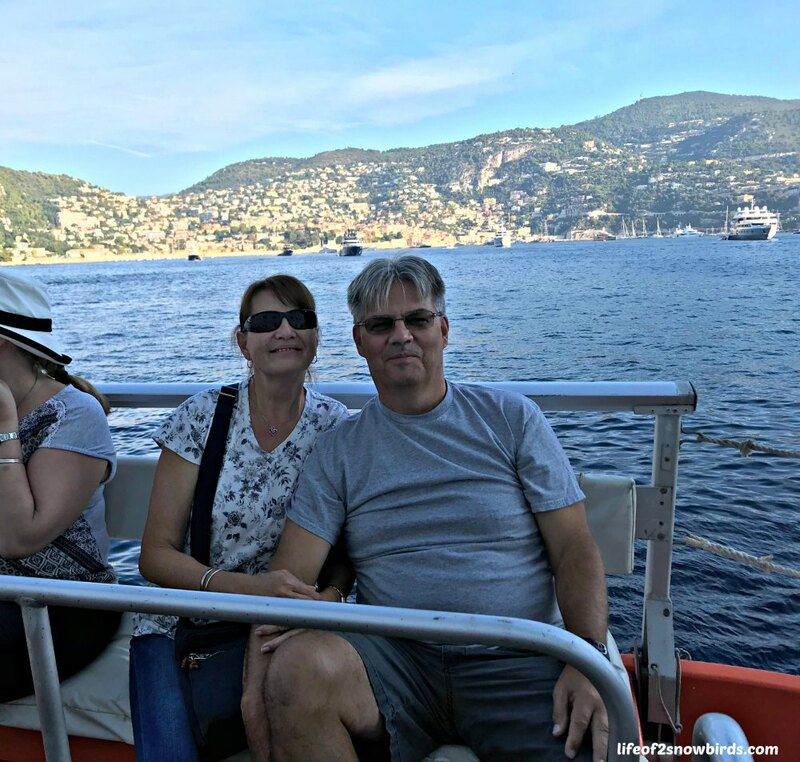 Our ship couldn't dock near land in Villefranche, though, so we started off our adventure in France with a tender ride to the shore. 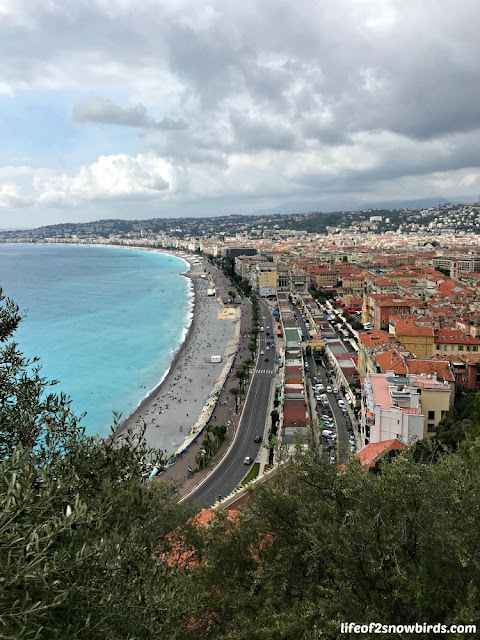 Monaco was also pretty easy to get to from Villefrance but since Nice is the largest city in the French Riviera and the closest major city to Villefrance, we decided that's where we would spend our day. We walked 10 minutes through the cute town of Villefrance to get to the train station. If we would have decided to go to Monaco, mostly to see the famous Monte Carlo Casino, we would have wound up at this same train station going east instead of west. We found out that finding your way around a foreign country without knowing the language and not being able to figure out how to use Google Maps (yet!) was not an easy task. Somehow, we did make it to Old Town though. 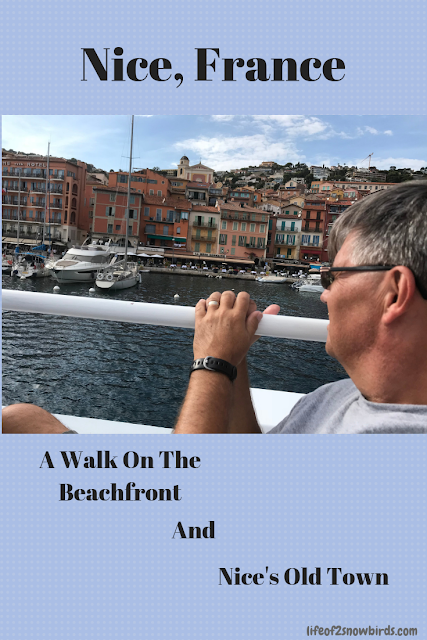 We were going to follow the walk that Rick Steves describes in his book, Mediterranean Cruise Ports. 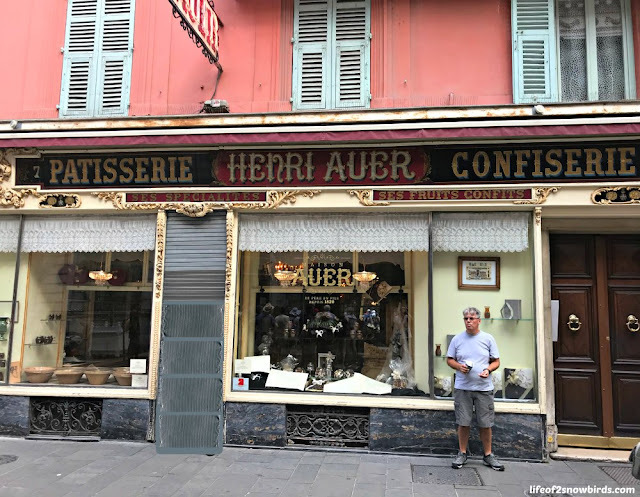 His walk starts at Place Massena but before we even got there we got off course when I spotted a macaron bakery. I found out that although macarons I have eaten in America are delicious, they are not as good as they are in France! They are completely opposite of France's, as a matter of fact. France's macaron has a much thinner cookie and double the filling. I am dreaming about going back one day to try every flavor. I can't believe I only tried one when we were there! After enjoying that delicious macaroon, we found Place Massena. We knew we were there when we saw the checkerboard pavement. I was excited about finding men sitting on top of high pedestals here. They were not hard to find! In this same plaza, we were to look for Apollo holding his beach towel. We would have to walk past him to get into Old Town or Vieux Nice. 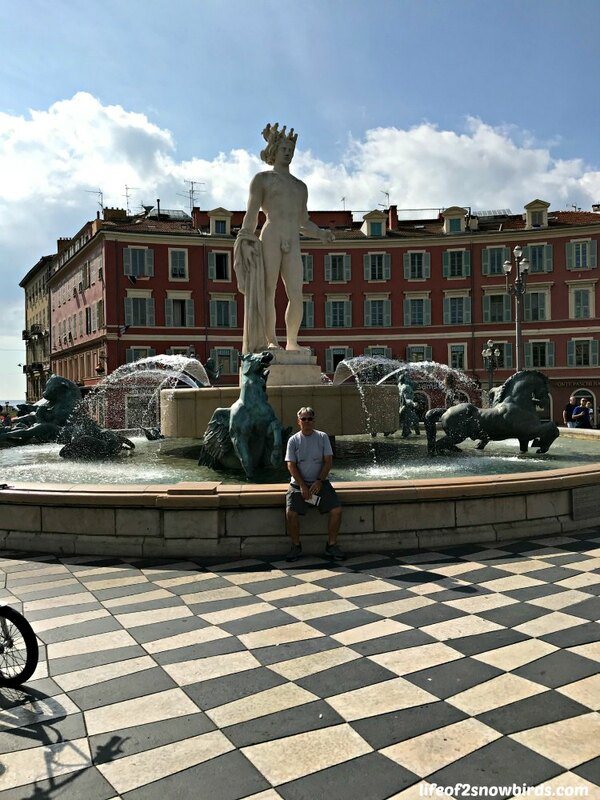 Just past this amazing fountain, we found Rue St. Francois de Paule. This street took us to the heart of Vieux Nice and on this street were shops that I was looking forward to shopping in. 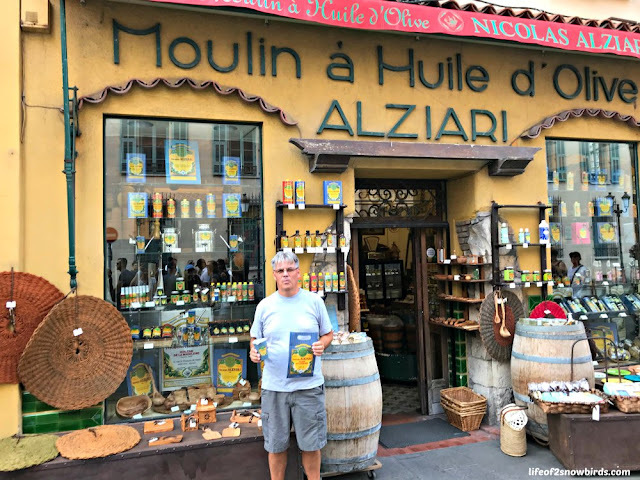 The first shop on Rick Steves walk that we wanted to shop in was Alziari olive oil shop. This shop has been in operation since 1868. We knew we wanted to to try their olives but didn't know that there would be so many choices. It took awhile to make a choice. La Couqueto was also on this street and is where we bought our santon. Santons are handpainted clay figurines that are usually used at Christmastime in nativities. We found a shepherd boy here that we used to decorate our home this Christmas. 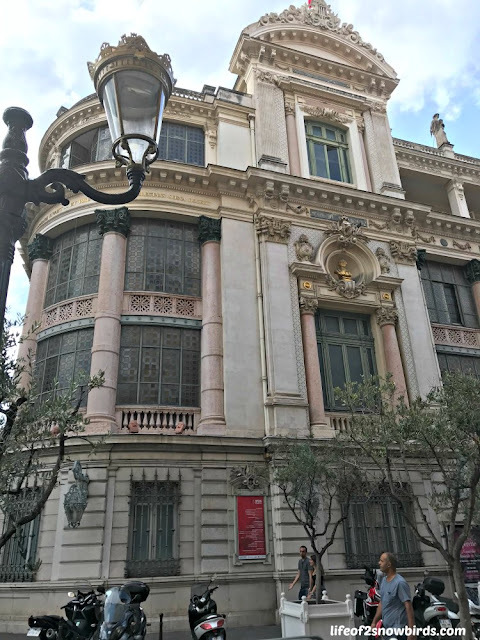 Next to find on Rick Steves walk, and still on Rue St. Francois de Paule, was Nice's opera house. The facade was as incredible as we read it would be. I was really excited about the building directly across the street from the opera house. 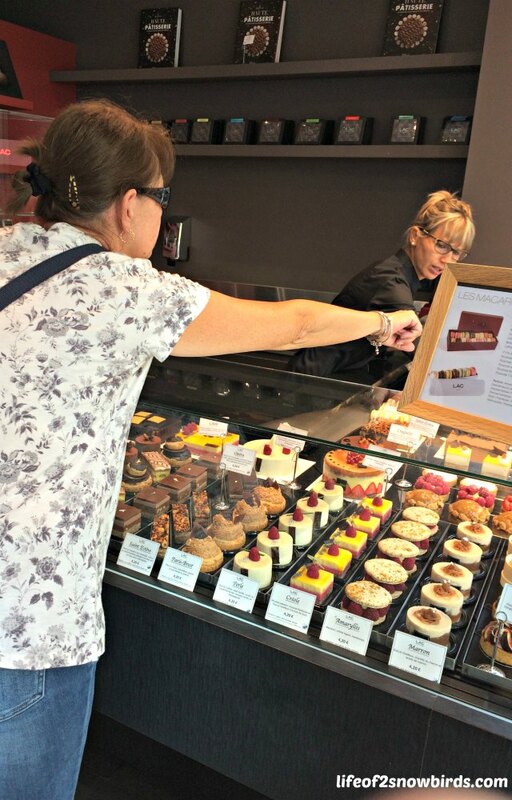 According to what we read in Steves book, Patisserie Auer's was where Queen Victoria would shop for chocolate. I would definitely have bought plenty of chocolate here but the store was closed! The next sight on our walking tour was Cours Saleya, Nice's main market square. The flowers that are sold here are the flowers that are used to make perfume. I couldn't wait to get a whiff of them. After spending some time at the market, we looked for the next street on our tour, Rue de la Poissonerie. We were looking for Adam and Eve on our right as we turned onto this street. We were to look up toward the first floor of the first building here to see them. Well...we searched and we searched and never found them. At first we were on the wrong street, but couldn't find them when we found the right street! But we didn't miss the small church, Notre-Dame de l'Annonciation. 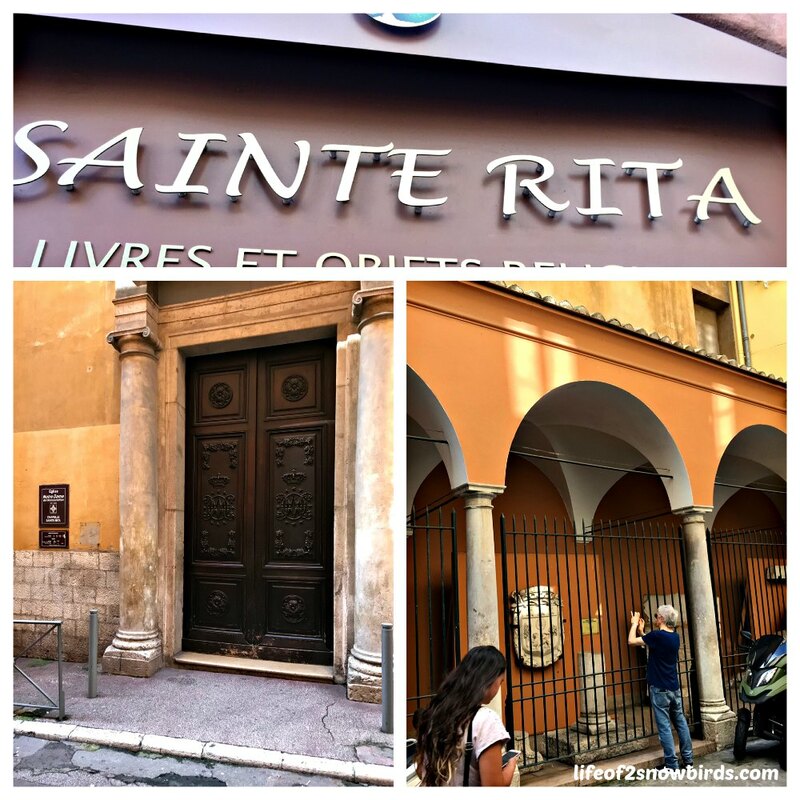 This church is the most popular church in Nice as it is dedicated to St. Rita. 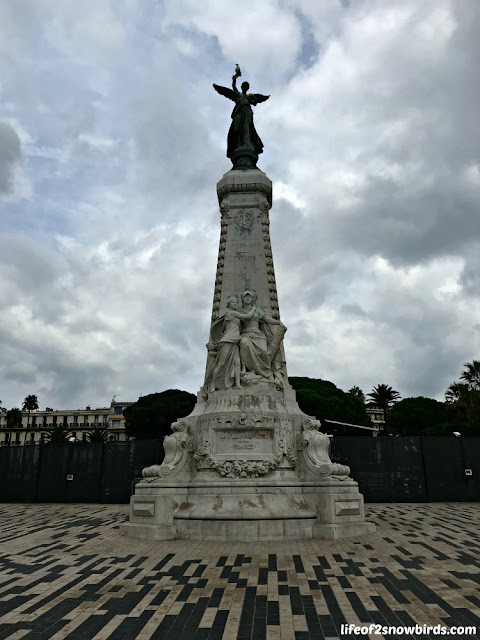 She is the patron saint of desperate causes and desperate people and she has a special place in the hearts of the locals here. From here we were to look for Rue Droite. On this street we would find Eglise St-Jacques le Majeur. It is a Catholic church and a Baroque style building. 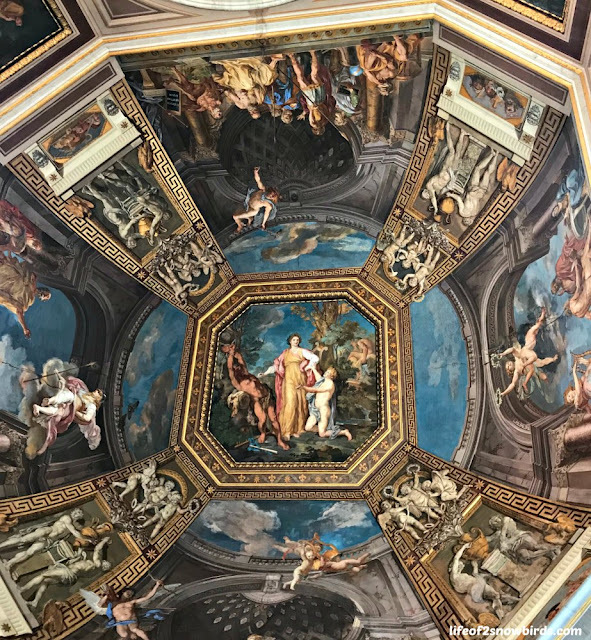 The definition I found for Baroque is "richly decorated with many ornaments, stucco, false marble, cherubs and medallions." It was definitely richly decorated and beautiful. Place Rossetti was where our walking tour ended. 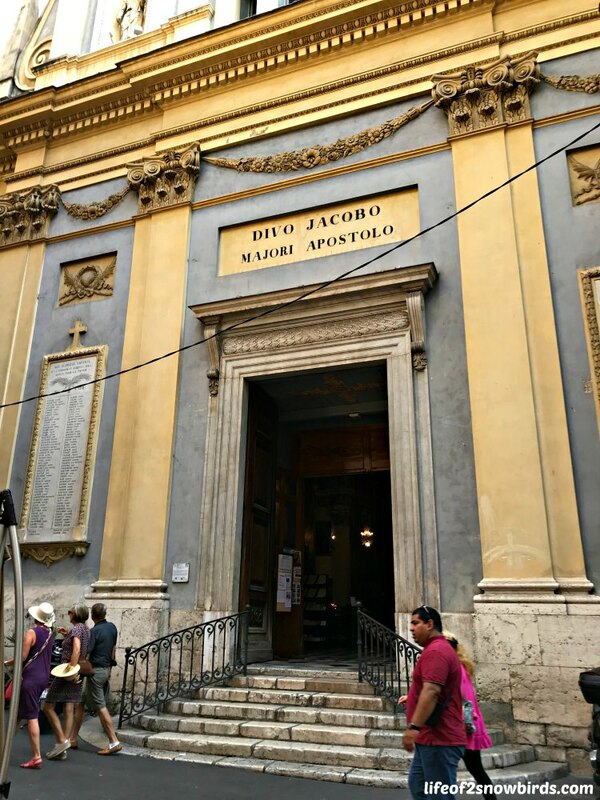 Here we found the gorgeous Cathedral of St. Reparate. One last stop before we left Old Town and headed to the beach. Fenocchios and our first taste of gelato! Looks like we saved the best for last! I think half the population of Nice was here enjoying the deliciousness! Before starting our second Rick Steves walking tour, we made a stop at Castle Hill. We had a choice of walking up the hill, to get to an ancient fort and great view, or taking an elevator. We took the elevator! We were so glad we went a out of our way to stop here. The view we were treated to was well worth it! 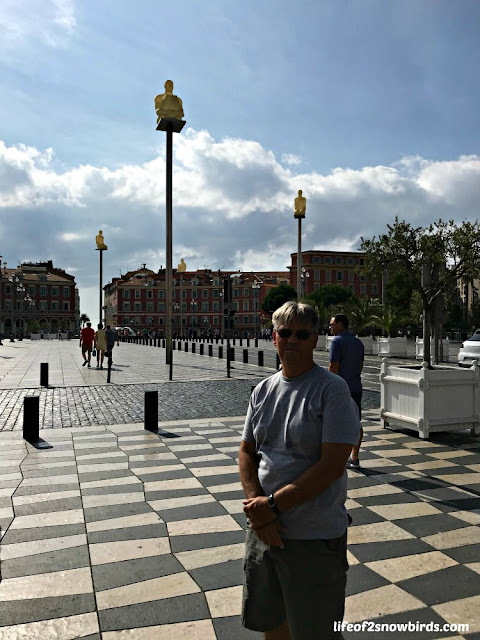 Rick Steves' Promenade Des Anglais walk was next on our "must-see in Nice" list. 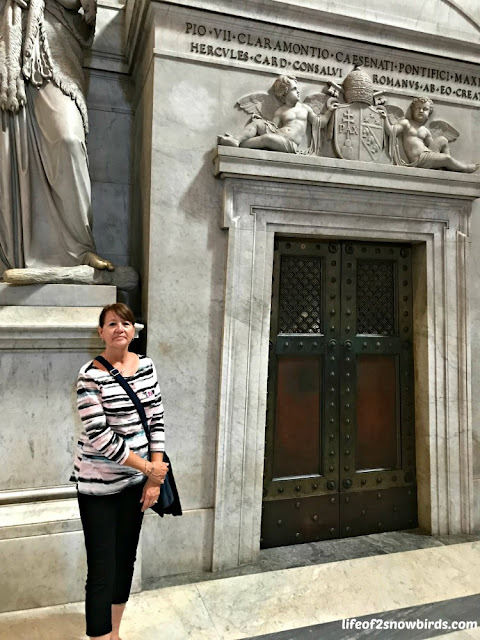 We didn't see most of the sights on this walking tour as we ran out of time to. We mostly just wanted to stroll along the beach anyway. If we had time, we might have took a peek inside the elegant Hotel Negresco and maybe checked out the Massena Museum to have a look at Josephine's cape and tiara and Napoleon's desk mask! What we did see was a beach like we've never seen before. We are used to seeing sandy beaches so seeing one as rocky as this one was a very unusual, but very cool sight to see. I also couldn't believe how comfortable the sunbathers looked laying on top of these rocks on their thin beach blankets! 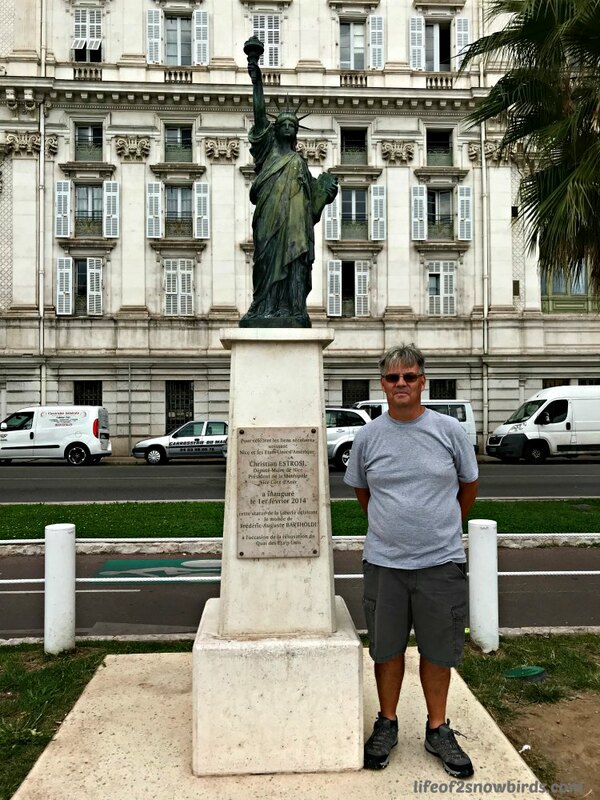 It took awhile, but we did find the tiny bronze Statue of Liberty that Rick Steves mentions as a sight to see on this walk. We took one last picture in our port city, Villefranche, before boarding our cruise ship. 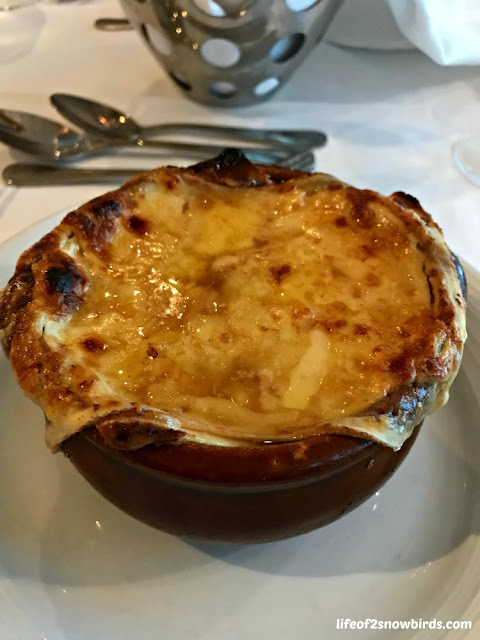 One thing I wanted to do was to eat some French onion soup in France. We looked all over but had no luck. Do they eat it in France or is it like french fries that are not really French? Well, anyway, lucky for me, the cruise ship had it on their dinner menu!